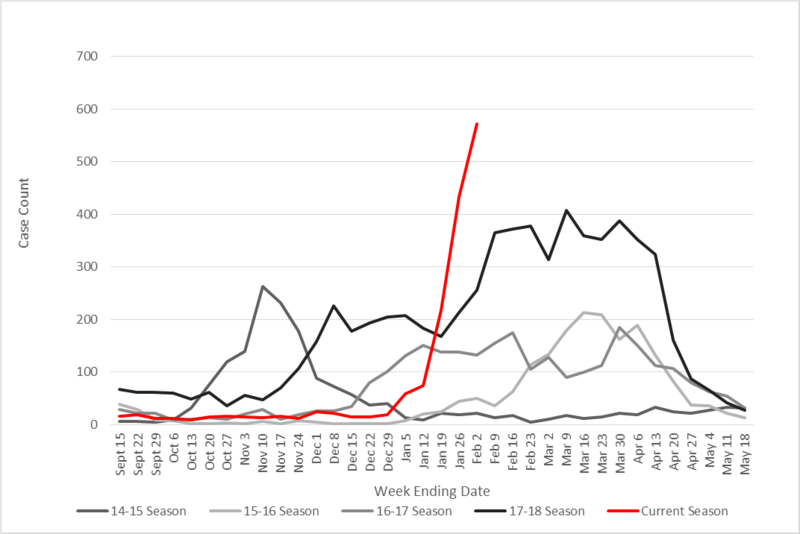 A graph of statewide lab-confirmed influenza comparing seasons from 2014 to the current season so far (Sept. 15, 2018 to Feb. 2, 2019). Flu season has arrived in Alaska. Mid-January saw a sharp spike in influenza cases felt around the state, including in Dillingham and reportedly in other communities around the region. Tania Erickson-Grant is a teacher at the 12-student school in Platinum, and she said that flu-like symptoms have hit hard. Flu season differs from year to year, but this January's sudden rise in illness is unusual. Dr. Joe McLaughlin is the chief of the Alaska Section of Epidemiology. “We really had almost no influenza activity – or very, very little – all the way through to the end of December. Then we saw a little bit of a bump in the first two weeks of January, and then a very abrupt spike that is continuing to increase,” he said. According to McLaughlin, the best way to prevent the virus from spreading is for people to get vaccinated. The reason for the current rise is unclear. The number of cases each year varies due to a variety of factors, including which strains of the virus are prevalent that season. That means the efficacy of the vaccine varies as well. In southwest Alaska, 75 cases of influenza have been officially diagnosed. 1,606 cases have been diagnosed statewide. Those who are sick do not necessarily have influenza; the only way to be sure is to get tested. Still, McLaughlin pointed to a few symptoms that can distinguish the flu from other sicknesses. The Center for Disease Control has several guidelines for preventing the spread of the flu. These include washing your hands, covering your mouth and nose with a sleeve when coughing, and staying home when you feel sick.